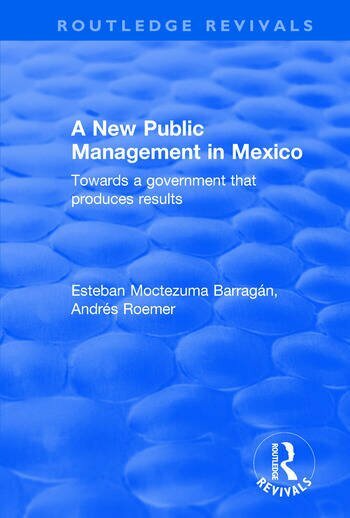 This title was first published in 2001: This innovative text applies new institutional economics, public choice theory, and new public management concepts to the political arena of the Mexican administration. Including cutting-edge benchmarking analysis about best practices of human resources and the modernization of the public sector, the book also considers the history and situation of other countries from the Mexican perspective, especially those of Latin America and the OECD. An essential text for all those with an interest in public policy or Latin American politics. Contents: Administrative modernization; The career civil service: a comprehensive system of professionalization, evaluation and performance of public servants; The Latin American experience; The experience of OECD member countries; Experiences of the civil service in Mexico; Final conclusions; Appendices; Bibliography. Andrés Roemer was born in Mexico City on July 12, 1963. He graduated with honours in both Economics (1983-1987) and Law (1983-1988) majors at Instituo TecnolÃ³gico AutÃ³nomo de México and Universidad Nacional AutÃ³noma de México. He obtained the master in public administration at the JFK School of Government in Harvard university in 1991 where he gained the Don K. Price Award. He obtained the Doctorate in Public Policy at the University of California Berkeley (1994) with fields of specialization Law and Economics, Institutional Economics, and Social and Sustainable Development Policy.